Dinosaur Jr. Sigh. I still remember when their video for Feel the Pain was on constant rotation on MTV. I liked them but had only heard a few songs. Then came Christmas morning, it was either '96 or '97 that I got a copy of their second album You're Living All Over Me. Mind Blown! The day after Christmas I went to the Newbury Comics store in Shrewsbury, MA and bought their first self titled album, their third album Bug and an album by Dinosaur Jr's bass player Lou Barlow's band Sentridoh. I then went to a flea market in Westboro, MA and while listening to Bug on my portable CD player and thinking how great it was. Now, 15 or so years later and I am revisiting Bug again with this new DVD, from MVD. 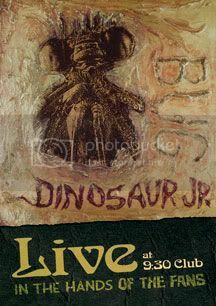 Dinosaur Jr. - Bug Live at the 9:30 Club features the three original members (J. Mascis, Lou Barlow, Murph) playing the entire Bug album live from start to finish. The performance was captured by 6 fans who won an online contest and who also got to meet and interview the band. This disc is part of the In the Hands of the Fans series, which also features a disc by Iggy and Stooges performing their Raw Power album (review HERE ). When I heard Dinosaur Jr's classic lineup was getting back together roughly 5 years ago I was stoked. They have since released two new studio albums and have toured several times. This disc is the perfect document for a fan who never saw them the first time around since they sound pretty much exactly the same as they did on record 25 years ago. My only gripe with the performance was that they had one of the fans come up and sing the song 'Don't', which Lou Barlow originally sang (he said he blew out his voice singing it the first night of the tour). Other than that though, the performance (which also included some songs from other albums added in) was perfect. Also included on this great DVD are interviews with the band by the 6 contest winners, an on stage interview with the band by Henry Rollins, Henry Rollins on the history of the 9:30 club, interview with J Mascis and director Dave Markey and two bonus live songs. This is simply a dream come true for a Dinosaur Jr. fan and even your typical concert film fan should enjoy it.